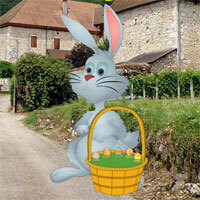 BigEscapeGames - Big Easter Bunny Land Escape is an escape game developed by Big Escape Games. A big escape game with tough puzzles. In this game, you came to an Easter bunny land to celebrate your Easter holidays . But unfortunately, you missed the way out. There is no one to help you. You have to find the way to escape from there by finding useful objects, hints and solving puzzle. Click on the objects to interact with them and solve puzzles. Good Luck Have Fun! 3rd set, hammer used again. Enjoyed this game. This is just me, but I stayed away from the posts because they gave too much. one of the few big games i've ever been able to complete with no help at all!